SPREO Indoor Location Solutions offers mobile positioning and engagement products for stadiums and arenas. SPREO’s suite of indoor positioning software technology and location based features provides a unique integrated solution that includes ‘Blue Dot’ indoor positioning and navigation, geofence zone and proximity-based triggering for push notifications and analytics, campus navigation with outdoor wayfinding and pinning locations (like your parking spot), and a cloud platform to manage the entire system in the cloud. SPREO has demonstrated the ability to deploy highly accurate and reliable Bluetooth indoor positioning systems that stand up to the rigorous challenges of arenas and stadiums. Our solution features weatherproof hardware, load- and stress-tested software, and turnkey custom deployment. Each venue has unique physical characteristics, and our experienced RF and IT engineers ensure universal positioning coverage across even the largest and most complex facilities. We work with venue owners and their agencies and app development partners to offer an easily-integrated and scaleable software solution via SDK. SPREO technology enables an end-to-end mobile engagement strategy that empowers venue owners, brand marketers, and visitors alike. 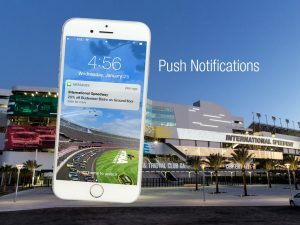 SPREO works with The International Speedway Corporation and the Daytona International Speedway, one of the leading racetracks and sporting arena companies in the United States. As a part of a new technology and mobile engagement initiative, they contracted SPREO to integrate a comprehensive location based services solution.